I got this recipe from my mother in law (who got it from her mother in law). Thanks to the Zulyniaks this is now one of my favorites! - Line 9x9 pan with graham crackers. - In a saucepan combine margarine, milk and brown sugar. Boil, then simmer. - Remove from heat and add remaining ingredients. Once mixed together, pour over crackers and cool. 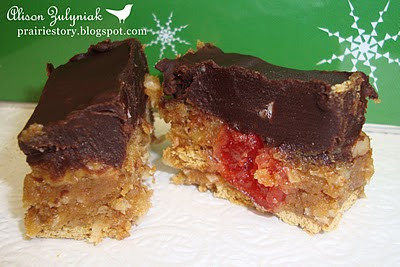 - Top with chocolate topping. In a small microwave safe bowl, melt chocolate chips, margarine and milk (about 2-3 minutes) stirring every 30 seconds to ensure they don't burn. Once all has melted together, stir in icing sugar and cover O'Henry Slice with it. Refrigerate to set. Oh wow, I think this is maybe the recipe I have been searching for - except my family put *pink* icing on it. I am going to try this version - awesome! I remember this bar... grandma's food is ALWAYS the best. I just did two posts of my grandma's fantastic gingerbread cookie recipe. I loved these. Why did we stop making them?